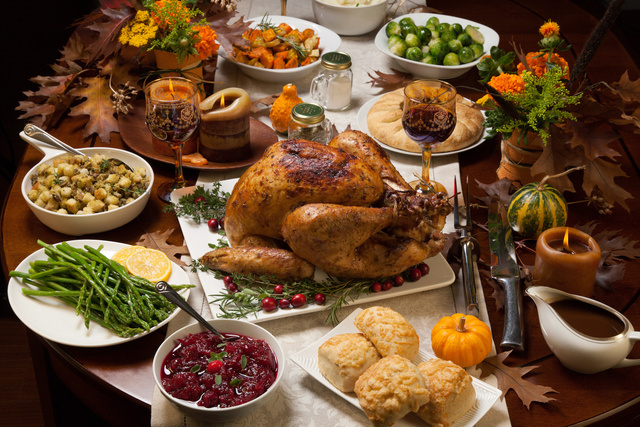 Turkey and mashed potatoes and cranberries and casserole and rolls (oh my gosh, rolls) and pie and basically anything you can consume that has obscene amounts of calories, fat and sugar. But, that’s beside the point. While the food is great (Or amazing or unbelieveable or majestic. I love food. ), there are more important things to think about on Thanksgiving. It’s a day when we put our busy lives aside and spend quality time with our families, often talking about what we’re thankful for. Let’s all go around and say what we’re thankful for! At this point, you practically death stare good ol’ Aunt Sally, annoyed that you have to relive this tradition each and every year. So, you try to hide your anger, listen to everyone talk about what they’re thankful for and come up with the generic list of things to say when it’s your turn. Let’s not do that this year. Instead, let’s really think about (and prepare a list of) all we have to be thankful for. Yes, it is 100 percent true that we should all be thankful for the love we feel surrounded by family, the delicious meal we are all about to enjoy, the warm house we’re all in and the ability to even have or do all of those things. Because, the reality is that so many people don’t have some or any of those things. Some people don’t get to celebrate Thanksgiving at all, let alone with their family. So, it’s important to be aware of that and thankful that you have that opportunity. However, that should not be your entire list of things to be thankful for, because I am sure you have so much more. You have to really dig deep and think about what you are truly thankful for. Think about the past year and think about everything you have been through and experienced. I am sure that you can come up with 3-5 things that have really made an impact on your life. These things can be experiences, moments or changes that have made a significant impact on your life. Or, they can be something as simple as passing your latest exam or finishing that project at work that you’ve been working so hard on the past few months. Choose things that have touched your life this year, and elaborate on those. Are you a new parent? Think of some things you or your child have gone through as a result of your newfound parenthood. Did you recently get a promotion at work? Think about what you did to get there, and what you learned along the way. Big life changes? Think about what happened as a result of those changes and how you got there. It might be hard to think of some of these deeper, more meaningful moments you have to be thankful for, so maybe my list will help you think of your own. It doesn’t have to be long, it just has to be impactful. Opportunity. This year was not only full of so many changes for me, but also full of chances for me to learn and grow along the way. I grasped onto every opportunity possible, and it all worked out in my favor. Challenges. Change comes with challenge, and that couldn’t have been more true for me. There were many times that I have felt incredibly uncomfortable, anxious and nervous of what laid ahead of me, and each time I overcame those challenges, I became a stronger, better person. Change. I guess since change resulted in the first two things I’m thankful for, this ought to be something I should thank, too. (Can you tell I’m thinking as I’m writing?) So many people are afraid of change, rightfully so, but change brings challenge and opportunity, which leads you to something great. I think that just about sums up this year of thanks for me. Like I said, it doesn’t have to be long, just impactful. This year, when Aunt Sally stops your family in their tracks and asks them what they’re thankful for, I challenge you to come up with 3-5 things that have truly impacted your life. Things that have made you a better person, and have made you truly thankful. Throughout the year, we should all take a moment to think about these things, and Thanksgiving is a great time to do so. I mean, it practically has “thankful” in it’s name, right? Life can be hard sometimes, and that makes us think that it’s hard all the time. When you sit down and think of things that have made your life great, you’ll be able to show your thanks for it. Happy Thanksgiving everyone! Enjoy the delicious food, family, friends and blessings that you’re surrounded with. You have so much to be thankful for. Happy Thanksgiving and blessings to you and your family.